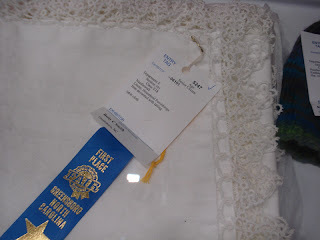 I didn't make my goal to enter something in the state fair, but I did enter in the county fair for the first time. Every year the internet tatting community encourages everyone to get tatting in the public eye in their area, so I finally did. 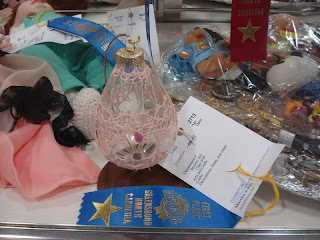 In my age division, there is only one actual tatting category "Item decorated with tatting", so I chose also "Bag, needlework", "Needlework, other", and "Christmas tree ornament". 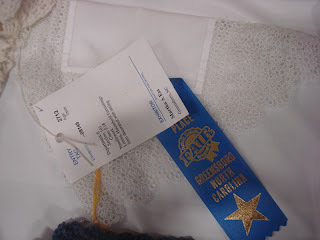 I didn't know what to expect, but I was pleasantly surprised to come away with a handful of blue ribbons. 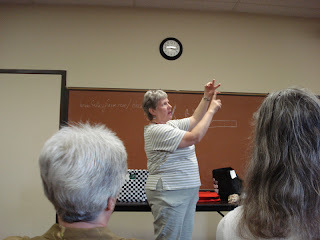 This was my ornament made from a pattern by Terry McGuffin. My tatted handkerchief from a vintage pattern made with size 100 cotton. 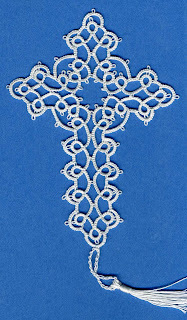 A mixture of tatting, crochet, and vintage turtle braid from a pattern reprinted in "Old Time Crochet" magazine some years ago. My own large motif/small doily butterfly combining tatting and hairpin lace. 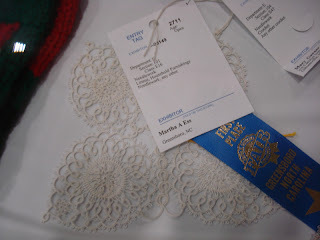 I was glad to see one other tatting entry, an edged tablecloth by a lady in the senior division. 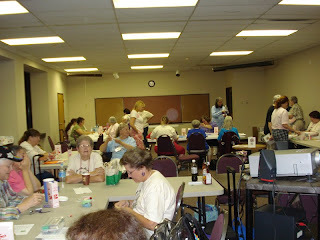 While I had some time to waste until I could collect my pieces, I wandered through the rest of the pavilion. 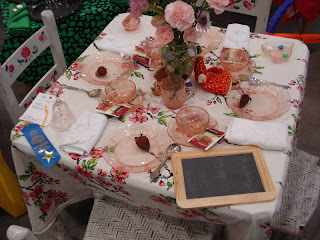 The table setting competion included a children's division. There are no scheduled events on Thursday (except for a teachers's meeting), but many arrive then to be ready for a full day Friday. 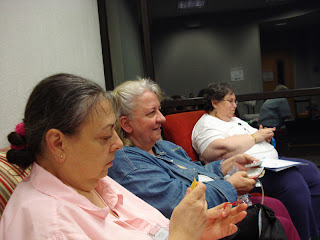 Hanging out in the common area Thursday. Just sitting around is one of my favorite things there. 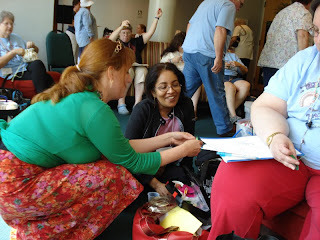 Great for visiting, looking at each other's stuff, and sharing techniques. More sitting and sharing Thursday. Vending opens Thursday as well. 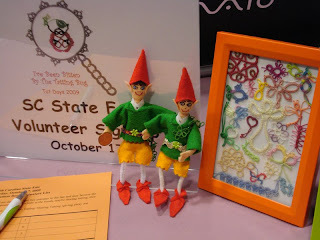 Tatting heaven! 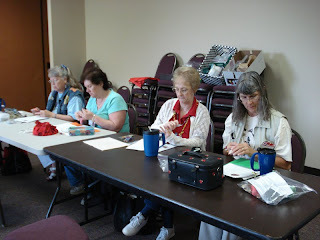 Friday begins with the Trade-a-Tip session, with several folks sharing ideas with the crowd. 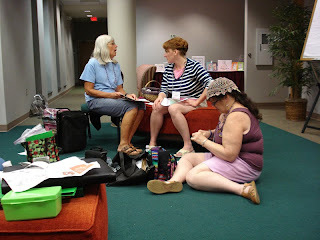 More sharing time in the common area. 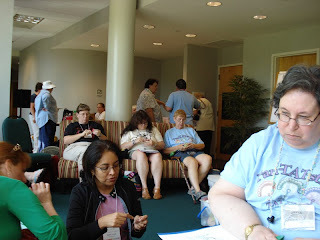 After the Friday afternoon classes comes a Fun-and-Games session and the speed tatting contest. The banquet is Friday night. 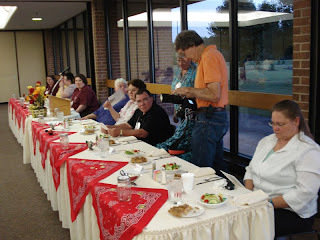 Entertainment at the banquet is provided by Georgia holding an auction. Once you've seen one of these, you will never forget it. After the banquet comes the Night Owl session. 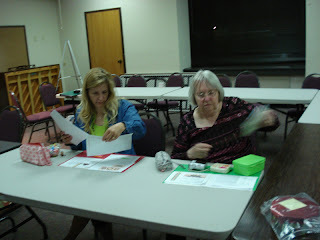 This begins with Riet teaching a pattern. We tat as long as we can and then stay on talking once we are too tired to tat. 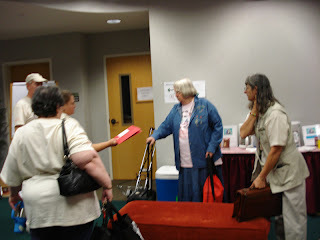 Here are the last to leave after everyone else has finally given up and gone to their rooms. Saturday has a full day of classes, beginning with the Early Birds at 6:00 am. (That's the one event I don't get to.) The classrooms are nice, with lots of room on the tables. 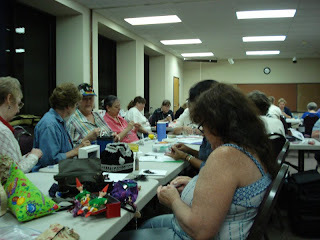 Saturday night has another informal get-together, this time working on cards and sachet bags for a fund raiser, and another chance for socializing. Last ones out Saturday night -- or was it Sunday morning by then? Sunday morning there is breakfast and one more round of hugs and good byes. Sorry, no pictures that day. 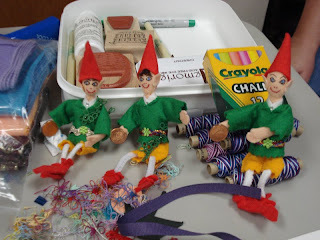 See it all at the Leprechaun's blog. 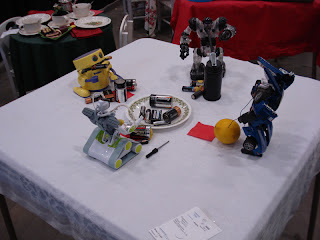 Lately I've been too busy to blog and too tired to tat. I just hope I can get ready for Palmetto in time. Thank you to everyone who expressed condolences. 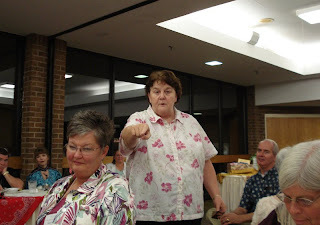 I am still trying to get back on track after two deaths in the family. Last week I did find time to tat this little cross bookmark for a special thankyou for someone. 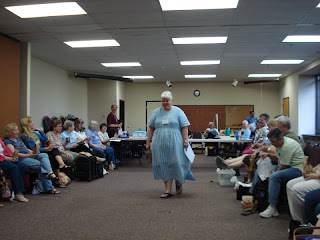 The pattern is from Mary Konior's Tatting with Visual Patterns. It is made in two rounds and works up quickly. I will count it in my current 25 Motif Challenge, though I forget what number I'm up to on this third time around. I also recently took off a few hours to go downtown for a free concert in the park featuring the Carolina Chocolate Drops. I really enjoyed that and it was so nice to get away and relax a little.